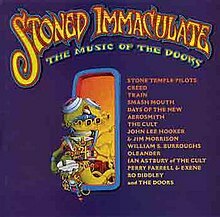 Stoned Immaculate: The Music of The Doors is a tribute album dedicated to The Doors. Producer Ralph Sall gathered an assortment of new, classic and iconic artists for the record. Unusually, the surviving members of The Doors played on this tribute record. In addition, recordings of Jim Morrison were used posthumously, in the creation of some of the tracks. Another posthumous usage, the cover features a painting by Rick Griffin. The album title is a lyric taken from the song "The WASP (Texas Radio and the Big Beat)." This page was last edited on 28 October 2018, at 08:04 (UTC).